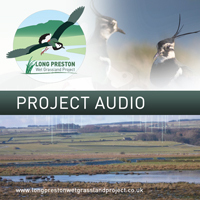 Welcome to the Long Preston Floodplain Project which aims to provide local people and visitors with an update on the project and what it is planning this year. 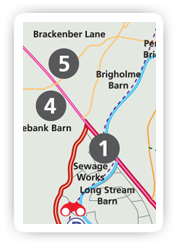 Have you driven along the A65 recently and looked out over the flooded fields around Long Preston? You may have noticed that several areas of open water have been created, that the rush has been cut and that there are increasing numbers of birds on the floodplain. If so, then well spotted! These changes have been brought about through the Project, by working closely with farmers and landowners in the floodplain who have entered into agri-environment schemes which fund the wetland management. 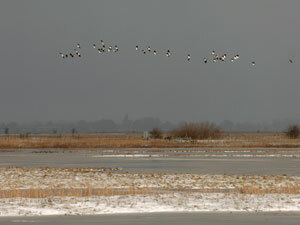 The Long Preston floodplain is a unique area with abundant wildlife at any time of year. Some of the seasonal highlights on the floodplain include flocks of migrant birds resting awhile on the their intrepid journey south, aeronautical acrobatics from displaying lapwings as they twist and turn and tumble out of the sky, the drumming of the snipe on a warm spring morning. All sights and sounds which remind us that this wet grassland is a haven for wildlife. The Long Preston Floodplain Project began in 2004 aiming to improve the wildlife value of the River Ribble floodplain in the Long Preston area. The area naturally floods every year and is a nationally important nature conservation site, providing valuable habitat for wading birds and aquatic plants. The land is owned and managed by local farmers, who play a vital role in the project. The Long Preston floodplain can be easily seen from the Ribble Way, Settle-Carlisle railway line and the Wigglesworth to Rathmell road. The project also aims to develop the potential of this fantastic natural resource for the local economy. 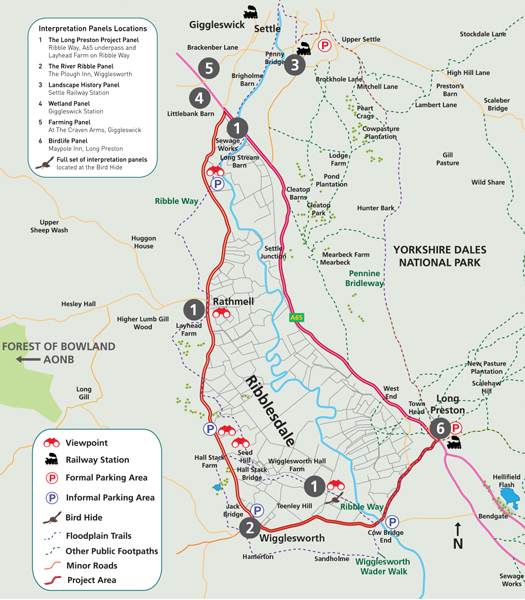 This will improve the quality of existing access and facilities for people to enjoy and learn about the birds, wildlife and grassland management and landscape history of the floodplain.